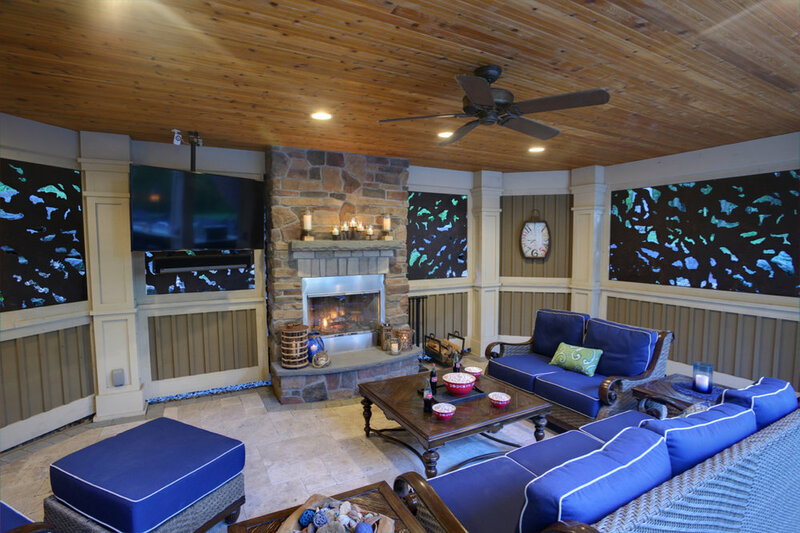 After enduring the plain deck and patio that the home builder installed a decade ago, this family was ready to invest in an outdoor living environment that would reflect the quality of the house. Although attached, the new structure needed to make users feel they were outdoors and extend the season by providing versatile options for lounging, entertaining and enjoying the pool. Mission accomplished! The owners say they spent “about 3000 percent” more time outdoors during the first year of having the revamped outdoor space. Distinctive ‘Winter Branches’ art panels from Parasoleil are reliable conversation starters whenever new guests arrive. The 1/8-in. aluminum screens are laser-cut and powder coated in a deep bronze finish. 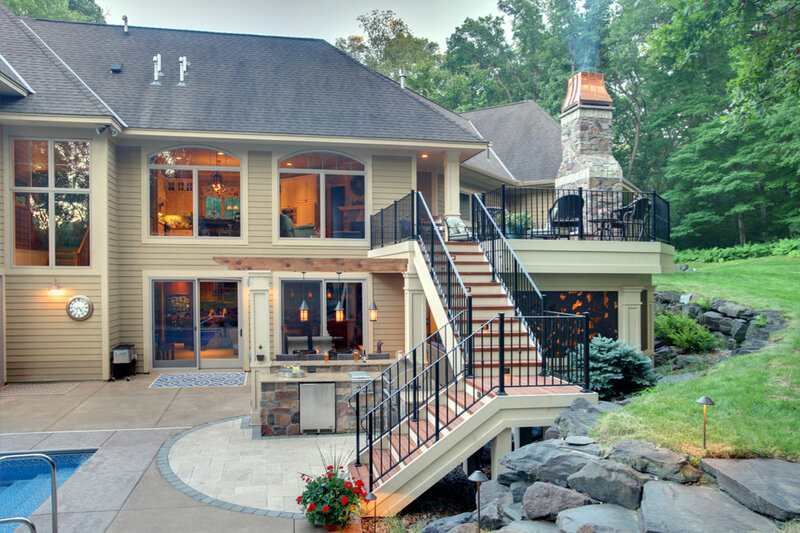 The handsome cultured stone and copper fireplace on the upper deck creates a warm outdoor atmosphere while drawing one’s admiration from inside the house. The stone also matches the indoor kitchen and fireplace. A combination of the wood-burning fireplace, natural tongue-and-groove ceiling and bronze art panels create a cozy but airy sheltered retreat nestled under the deck and tucked within the boulder retaining wall. Premium Zuri Decking, custom wrought iron railings and stonework accent the stout mission style columns and skirt boards that match the house color. Patterned and random paving and stonework define spaces while contributing color and texture. 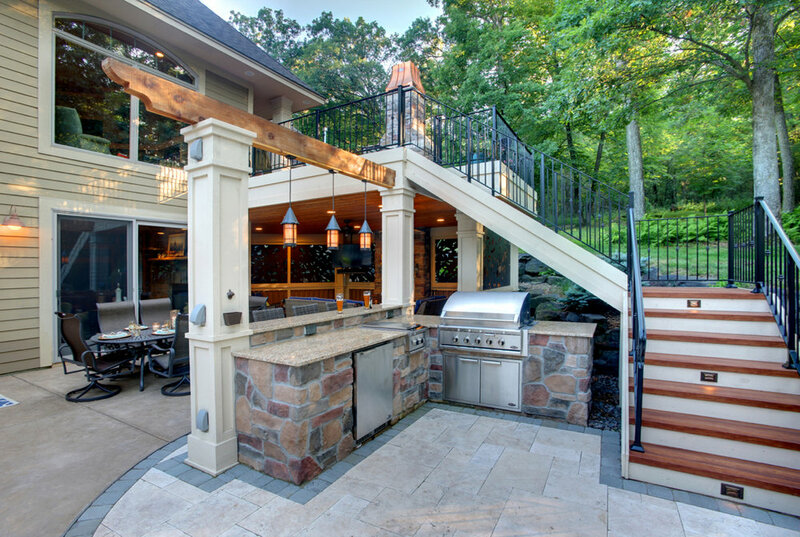 The owners requested the beam above the bar be stained to match the decking and accent the architectural detail. Unused under deck space now offers all the comforts of home. The versatile two-level structure provides both open and dry environments. Premium, fade-resistant, cellular PVC Zuri decking, a green building material, looks like exotic rain forest hardwood but requires minimal maintenance. Laser-cut aluminum art panels provide privacy while permitting airflow and natural light. They also cost less than the masonry specified in the original design. An accessible wood-burning fireplace in the lower space supplies warmth and aroma-therapy. A gas fireplace insert on the upper deck offers instant on-off convenience without having to haul firewood or clean up the mess. A new stairway is turned, lighted and finished with custom wrought-iron handrails. Contrasting risers provide a gentler angle and improved visibility. This created a safer, kinder transition between the two levels, especially after a good amount of evening cocktails. The kitchen/bar area midpoint between the lower room and pool incorporates a premium DCS built-in grill, burner and refrigerator within the Venetian Gold granite and stone structure. A weather-rated TV is perfect for enjoying Vikings-Packers blow outs. To keep the lower room dry, the builder installed a watertight EPDM membrane over tapered sleepers that empties into a hidden gutter in the middle of the upper deck. The gutter drains through downspouts hidden in the column wraps and out to a catch basin and drain tile. Aluminum art panels are used in place of masonry walls to control costs without sacrificing distinctive design. When the fireplace moved after the initial plan, the designer raised the chimney and custom copper shroud 42-in. to meet fire codes for the roof overhang. She also lifted the taper for scale. Special detailing around the fireplace ensures the synthetic rubber deck membrane is both watertight and vented. Masons incorporated brick rowlock banding on the fireplace to match a detail on the home. The rowlock on the outside matches the deck skirt. Handcrafted wrought iron railings surround the deck and stairs. What do you think of this beautiful space? Click below to schedule an appointment and let our award winning designers transform your outdoor living space!